When a visitor comes into our homes there is a certain etiquette of social responsibility that governs their actions. Basically, the visitor shows respect, is gracious, is careful to avoid doing any damage, and follows the "house" rules. You don't have to walk on many trails these days before you see some form of damage to the lands. Whether it is an ever widening trail, litter, shortcuts, tree graffiti (carving), or ?? ?, if we use the trail without a sense of wilderness responsibility guiding our actions, then damages may occur. At a local park, where I have hiked for years, I have the seen the path widened and changed by the shoes of many hikers. The trail in the park has been straightened a bit in places, in other spots it has had slight detours, and in many places it has been widened. It almost seems like a natural progression. For example, the park has a 5 mile loop. On a nice weather day, you might meet 50 other hikers on the trail. 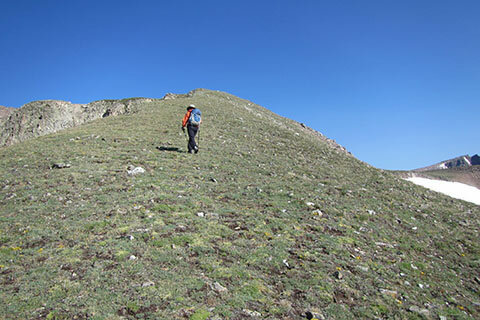 Each time hikers pass each other, each hiker moves to the side a bit and the land receives footprints off the trail. The path grows wider just from the sheer volume of hikers. So what is a concerned hiker to do? Our public lands are an important part of our American heritage, but, most of the lands are unfortunately, easily damaged. The actions of a user might not be intentional, but the results are still damaging. Showing a healthy respect for the lands and being gracious for the opportunity to use the lands are important to help prevent unintentional damage, such as the footprints of hikers expanding the trails. 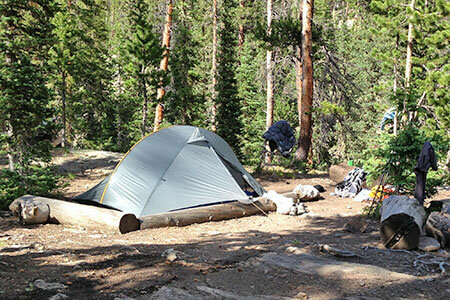 Will a simple acceptance of Wilderness Responsibility help lessen damage? The many mindful users who are willing to avoid damage will set a norm of trail etiquette. What then is right and what is wrong? The simple answer is: damaging the land is wrong. A footstep off the trail causes some damage. So stay on the trail. Think before stepping off the trail. Is there another option? If I slow down, will I meet the hikers in a better location? 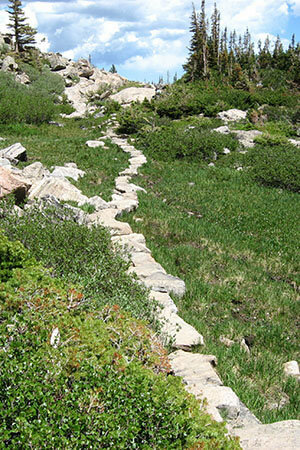 It is easier to arrange to pass other hikers at a wider section of the trail and without having to step off the trail. Of course this is just the beginning, but that same mindfulness is transferable to any action or activity. Keeping in mind to respect the Land, to be gracious for the opportunity to use the land, and to avoid damaging the land, will help us protect all the lands. Most of the actions that cause damage to the lands are obvious to the responsible user. The more conscious and knowledgeable the hiker is in regards to minimum impact usage, then the more damage they will recognize. At times it is best just to not use the trails. In Vermont in the spring, many of the trails are closed. The thawing trails and wet weather leave the trails soft and susceptible to damage by simply walking. With experience, the user will learn new ways and methods to avoid damaging the lands.